A flier for the event sits on top of other fliers for SJP. Photo by Ella Abbott. Editor’s Note: MJ Eckhouse, Fusion’s Editor-in-Chief, was a part of the panel Wednesday evening as a guest of the organization. Members of the Students for Justice in Palestine came together Wednesday evening for a panel to discuss #pinkwashing and how it relates to American society. The purpose of the panel was to bring light to what pinkwashing is, how it not only affects Palestine but the world as a whole. Panelists also hoped to inform students and faculty on what actions they can take to stop companies from pinkwashing and how to spread the word to other students and even celebrities to take a stand against pinkwashing and the abuse the #LGBTQ community face in the hands of Israel’s government. The panelists were Nico Rushh, is an e-board chair for Threads, and MJ Eckhouse, the Editor-in-Chief of Fusion. They spoke about how pinkwashing relates to American Society. For Rushh the problem with American pinkwashing is that America never wants to interfere with other countries’ treatment of the LGBTQ community but still wants to consider itself an ally. Eckhouse later talked about how America still has a long way to go with their gay rights and the acceptance of the LGBTQ community in America. 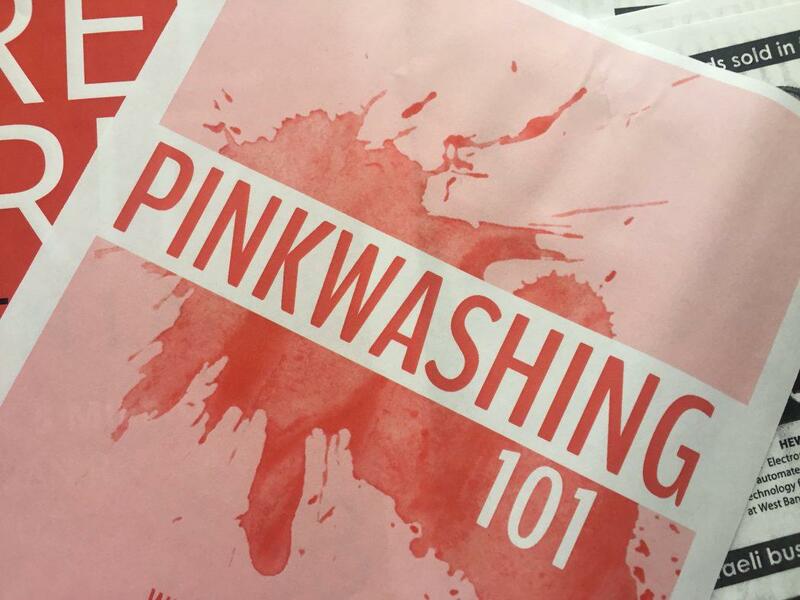 Amanda Michalak, an alumna of Kent who graduated in the political science department and a previous member of Students for Justice in Palestine attended the event and hopes it will broaden people’s understanding of pinkwashing. Nina Darden, who is a senior community based health major came to the event without any prior knowledge to what pinkwashing was but walked away with newfound knowledge and perspective on the issue at hand. “I did not know what pinkwashing was beforehand, I’m sad I didn’t because it’s about breast cancer awareness and that’s public health all the way,” Darden said. “But I came here tonight because a lot of my friends are in SJP and I fully support all the BDS movements that they do. Darden went on to explain why events like these are important.